We are truly grateful to the family of volunteers, donors and sponsors that make Operation Teddy Bear possible each year. 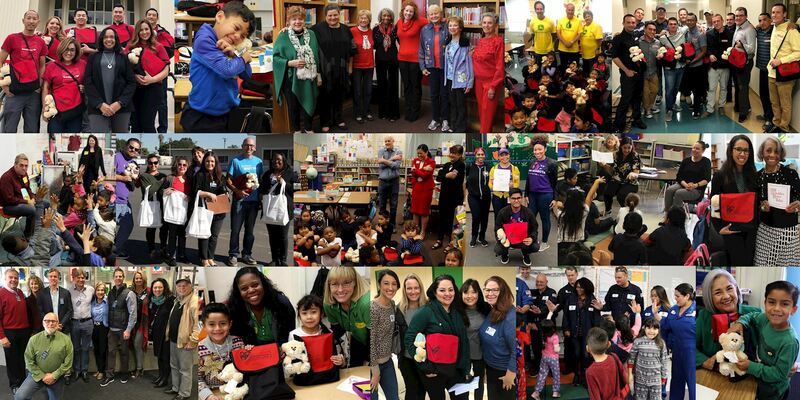 Together, we provided more than 4,000 local, underserved first grade students with our signature schoolbag filled with books, educational supplies and wellness tools, as well as more than 150 first grade teachers with appreciation kits. Volunteers also inspired the students at the 36 schools they visited during a lesson in kindness, compassion, volunteering and identifying emotions before distributing their surprise gift. Learn more about this year's program below! Preparing Schoolbags | Distributing Schoolbags | Program Updates | Thank you Sponsors and Donors! After three days of packing, our team of volunteers helped us prepare more than 4,000 Operation Teddy Bear schoolbags so they were ready for distribution! 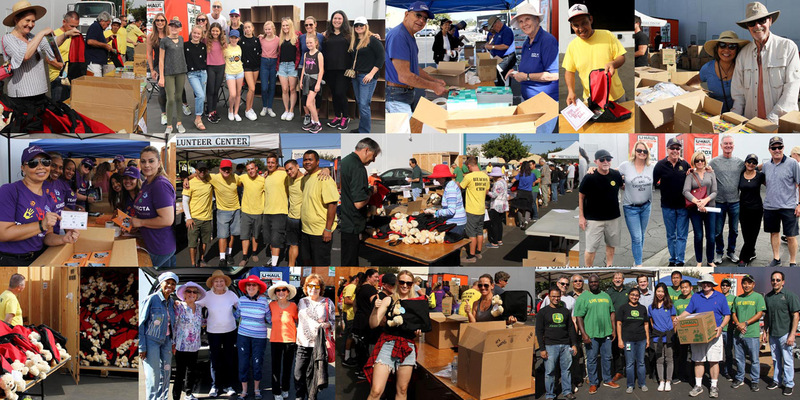 We couldn't have done it without the help of our amazing volunteers, including representatives from our Affinity Group, Beacon House, John Deere, Kinecta Federal Credit Union, Rotary Club of Manhattan Beach, Sandpipers, Sandpiper Juniors, South Bay Touring A's, and Uhaul Moving and Storage of Carson, as well as some of our Food For Kids volunteers. We are grateful for the enthusiastic and hard-working volunteers who took the time to distribute the schoolbags and visit with the students, including representatives from our Affinity Group, Bank of America, Beacon House, California Water Service, GreenVetsLA, John Deere, Keenan & Associates, Kinecta Federal Credit Union, Los Angeles Trial Lawyers' Charities, Rudolph J. and Daphne A. Munzer Foundation, Nonprofit Partnership, Port of Los Angeles, Rotary Club of Manhattan Beach, Sandpipers, Simon Law Group, South Bay Junior Women's Club, St. Anthony High School, Valero, Watson Land Company, as well as several individual volunteers. There were a few new additions this year. They included an engineering construction kit to help the students learn to build two- and three-dimensional shapes, a volunteer-made "rekenrek" to assist each first-grader with concepts of math and counting (and calm fidgety fingers), and inserts in a writing journal showing sentence-starters and sight words, all prepared by volunteers from Keenan & Associates. Each teddy bear also had a tag on it to remind the students what they were taught during the lesson: When you feel nervous or afraid, give this teddy bear a big hug and take a deep breath to help you feel better. We are extremely grateful to our major sponsors and in-kind donors for making this program a reality, including our Affinity Group, California Water Service, John Deere Foundation, Keenan & Associates, Kinecta Federal Credit Union, Los Angeles Trial Lawyers' Charities, The Molina Foundation, Rudolph J. and Daphne A. Munzer Foundation, Port of Long Beach, Port of Los Angeles, QuinStar Technology, Rotary Club of Manhattan Beach, Sandpipers Philanthropy Trust, Valero Energy Foundation and Watson Land Company. Click here to view a complete list of sponsors.